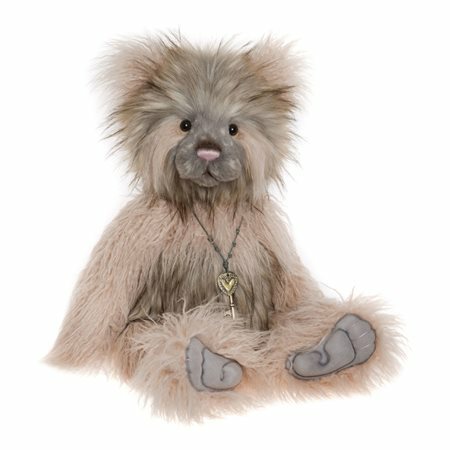 She is a gorgeous girly bear, who has long, shaggy peach fur that has some black tipping. Her face is taupe, with pieces of peach and this has created a freckled look on her shaved muzzle. She has peach teardrop panda markings, which show off her dark, twinkly eyes and her pink hand-stitched nose has some dark airbrushing for definition. Her pads have been sculpted and stitched and she wears a key pendant with a heart, which is on a knotted cord.